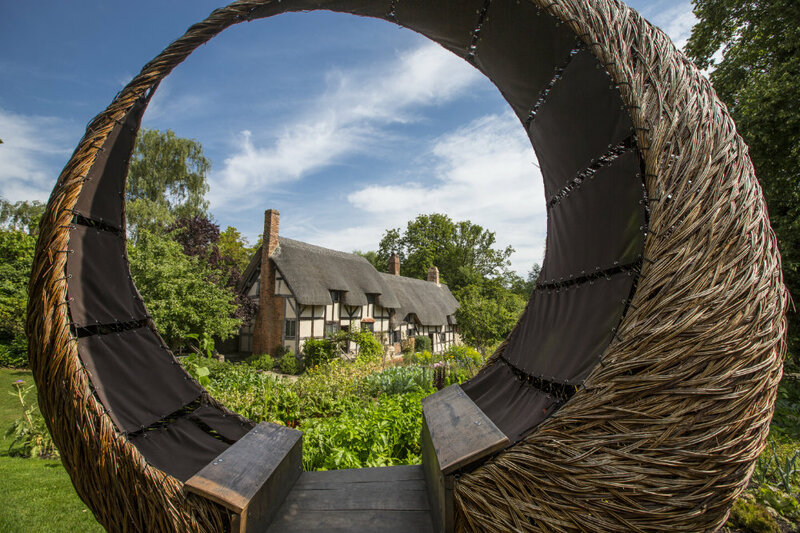 Earlier this year I was invited on a very interesting national Gardens Media Tour of the contemporary sculpture garden at Shakespeare’s New Place in Stratford-upon-Avon, and ongoing restoration of Ellen Willmott’s original designs at Anne Hathaway’s Cottage gardens, Shottery. 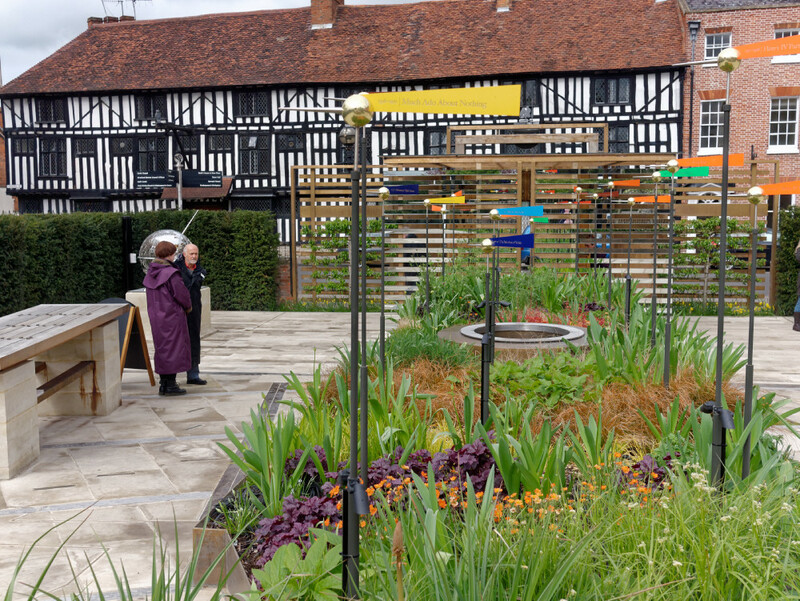 It was led by New Place Project manager Nic Fulcher, a historian, and Shakespeare Birthplace Trusts’ Head of Gardens Glyn Jones. We stopped for a delicious lunch at the lovely Anne Hathaway’s Cottage Garden Cafe en route – definitely well worth a visit too! 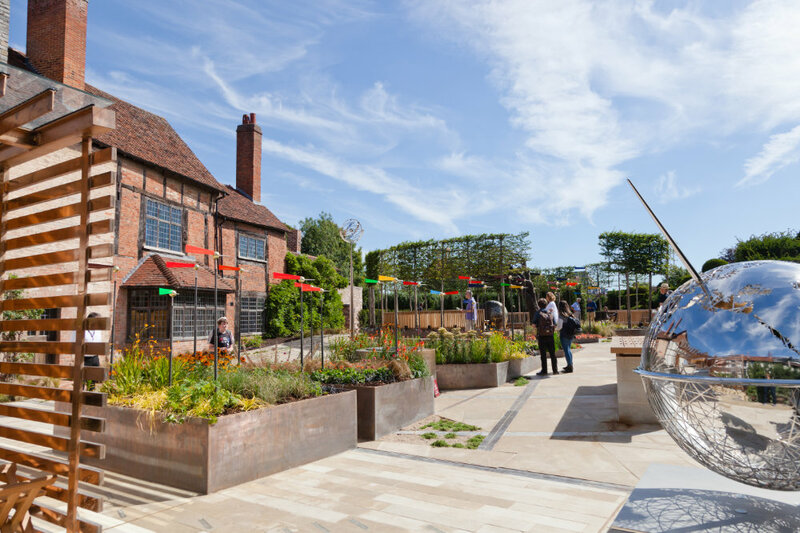 A stone’s throw away from the RSC Theatres in the heart of Stratford is the stunning contemporary new sculpture garden at Shakespeare’s New Place. It celebrated its first birthday on Sunday August 20. This is the re-interpreted site where Shakespeare’s family home once stood and where he lived until his death in 1616. 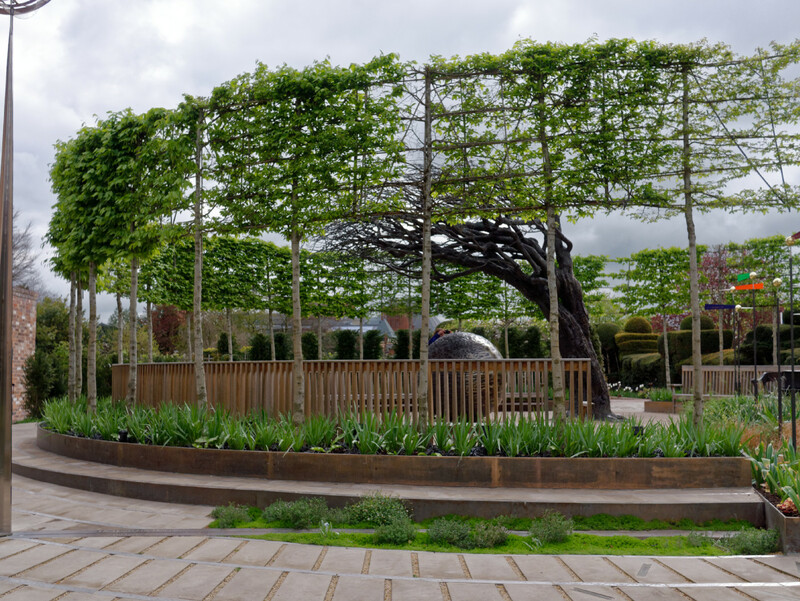 Specially commissioned new sculptures and artworks were unveiled to mark the 400th anniversary of the Stratford playwright’s death last summer. It was decided to re-design the space with the assistance of Theatre Designer Timothy O’Brien, an RSC Artistic Associate, and engineer Chris Wise, who helped design London Velodrome and the Millennium Bridge. 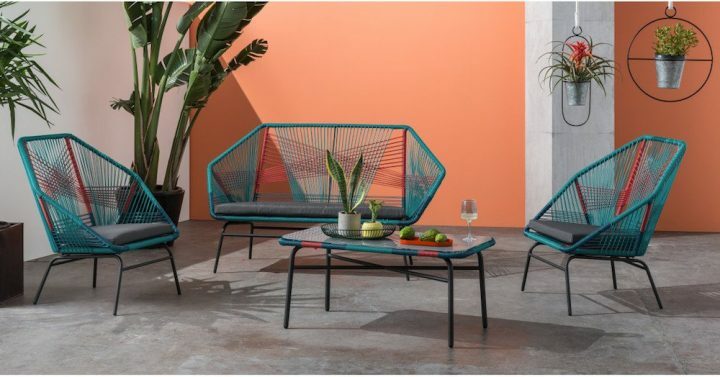 Instead of a literal representation of the house, they opted for an imaginative journey into the world Shakespeare knew with stunning new artworks, night lighting and garden designs. Every day there are Show and Tell Sculpture tours at 11am, 1pm and 3pm of the 2.5 acre gardens where you can find out more about the intriguing and striking artworks and what inspired the artists who created them. There’s also a Where’s the House? 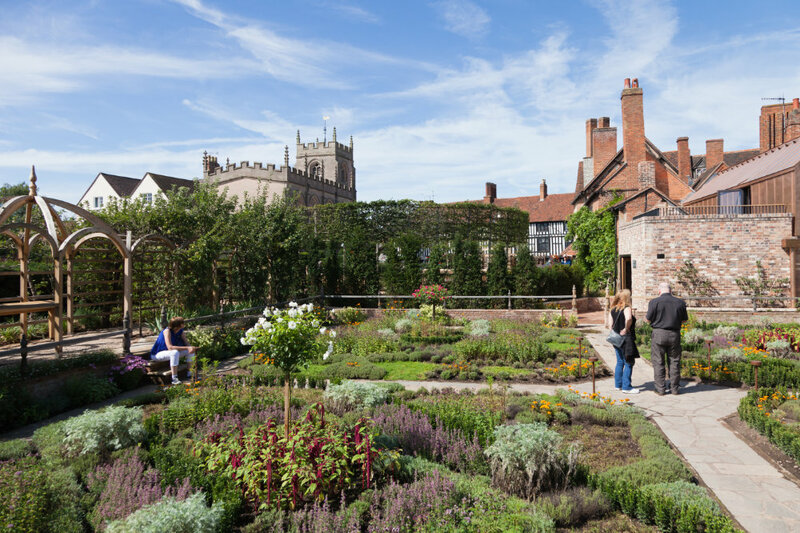 talk every 30 minutes about the fascinating history behind New Place, where Shakespeare lived for 19 years. The Gatehouse (below) by blacksmith Owen Mabbot and joiner John Beavan – an oak and bronze gateway where the entrance to Shakespeare’s house would have been. 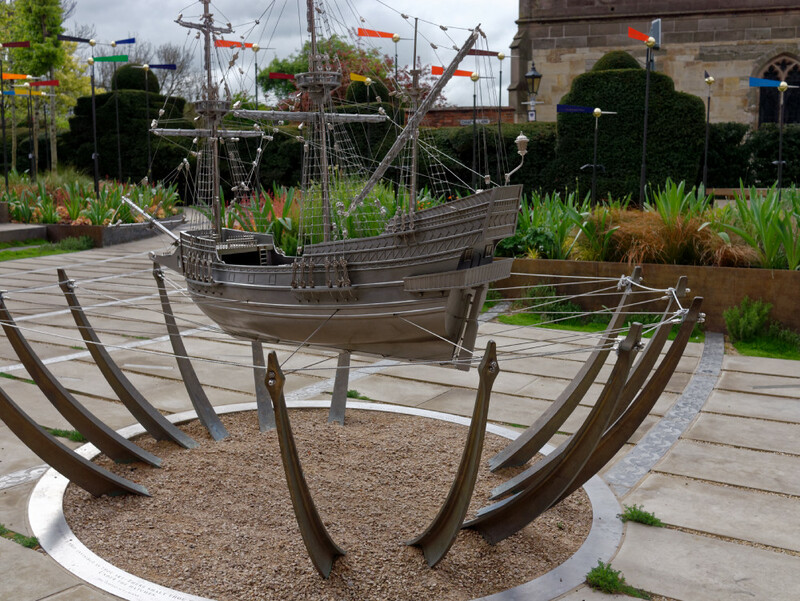 The King’s Ship also by Ben Ryan and Rupert Todd – a direct link with The Tempest and portrait of a Tudor ship. His Mind’s Eye by renowned South African artist Jill Berelowitz – an incredibly realistic 5m high bronze tree and cosmic sphere blown to one side by the force of Shakespeare’s genius, represented by his writing desk and chair takes central stage where his family’s living quarters would have been. Initially I did think it was a real tree. The Strongbox by Chris Lloyd in collaboration with Morris Singer art foundry – a reproduction of a Tudor strongbox, a symbol of Shakespeare’s wealth and the significance of New Place in the town. You can also climb up the new first floor viewing platform (on the right in the photo below) overlooking the Tudor Knot Garden, restored to Ernest Law’s original 1920’s design and see the sights Shakespeare would’ve been familiar with – the neighbouring Guild Chapel and his school, King Edward VI Grammar. 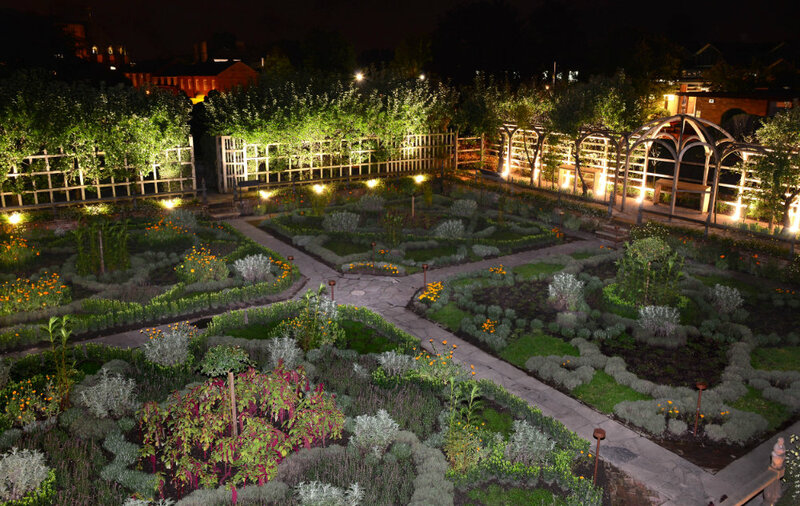 The Sunken Knot Garden @ Shakespeare’s New Place by night © Stewart Writtle & The Shakespeare Birthplace Trust Award-winning design practice Speirs + Major created a night garden experience using state of the art, low energy LED technology. 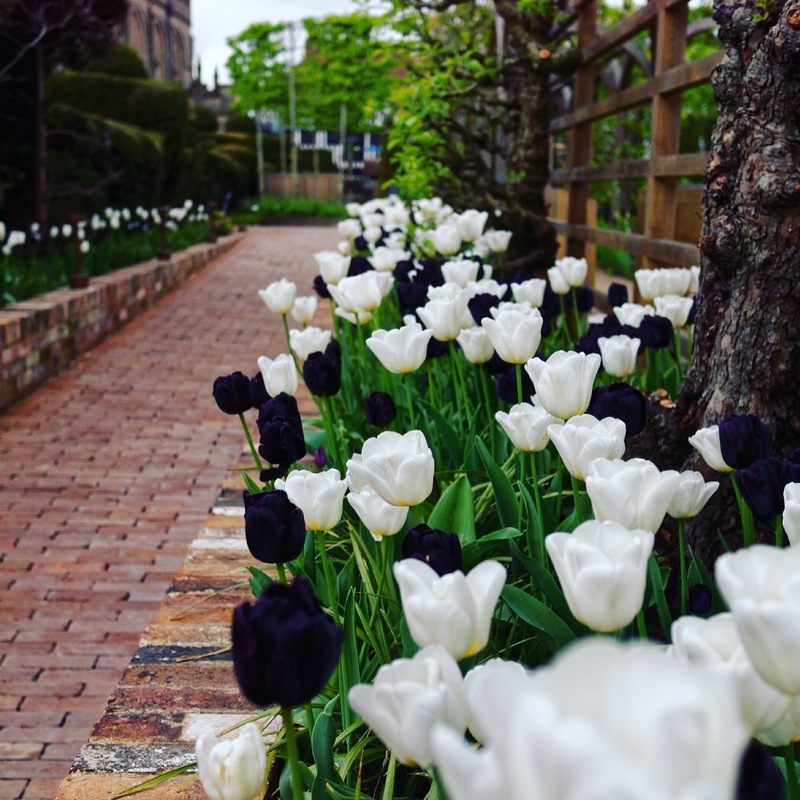 A dramatic array of velvety black and white of tulips were out in full bloom during our spring visit. 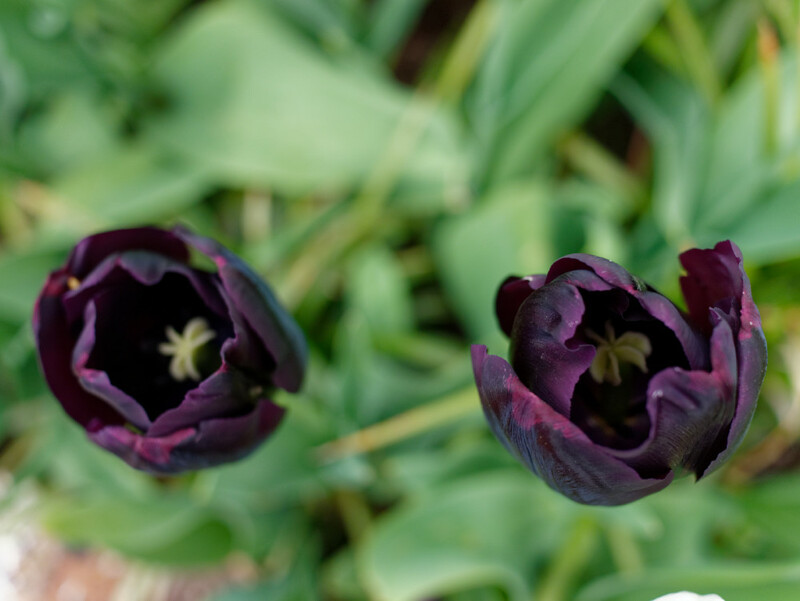 Spring tulips. The Grade I listed Arbour has been totally rebuilt to its original glory using heritage oak and dovetail joinery. 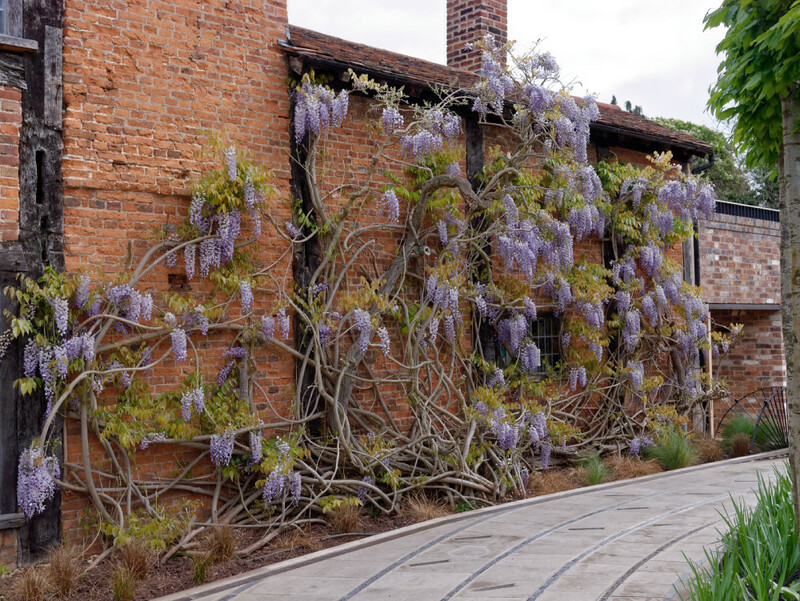 Wisteria-covered Nash’s House next door – which belonged to Shakespeare’s granddaughter Elizabeth and her husband Thomas Nash. 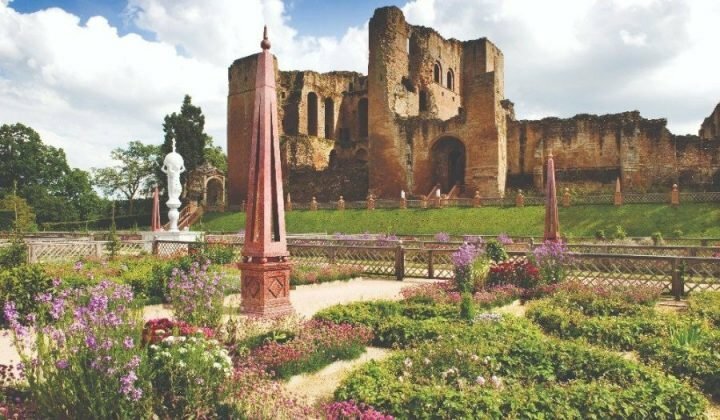 Beyond the Sunken Knot garden, the Victorian Great Garden with sweeping lawns, herbaceous borders and famous Mulberry trees has been retained. The Flowerpots and Forget-me-Nots Garden Talk on Aug 23, 2-2.30pm, is a must for keen gardeners as the site’s expert gardeners will reveal how they care for the borders and lawns, and share their secrets and top tips. 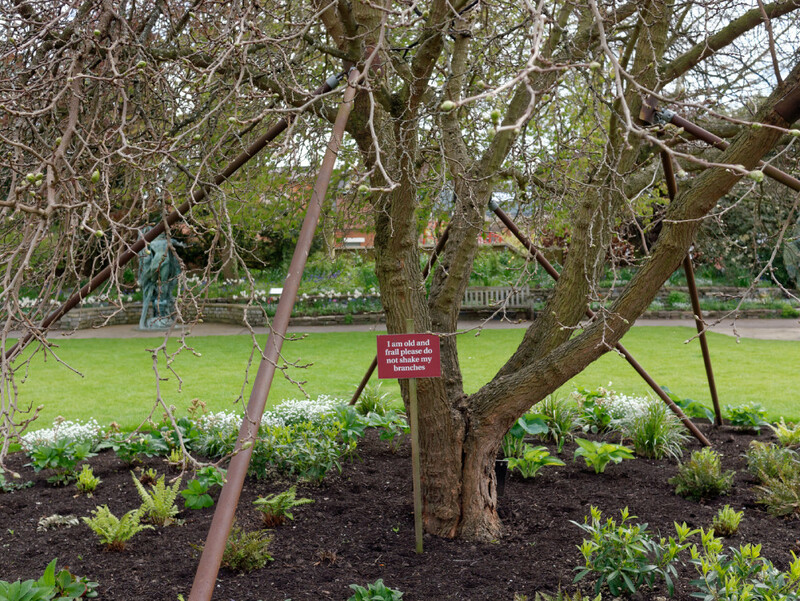 The oldest Mulberry tree in the Great Garden is reputed to have been grown from a cutting taken from a Mulberry tree originally planted by Shakespeare. 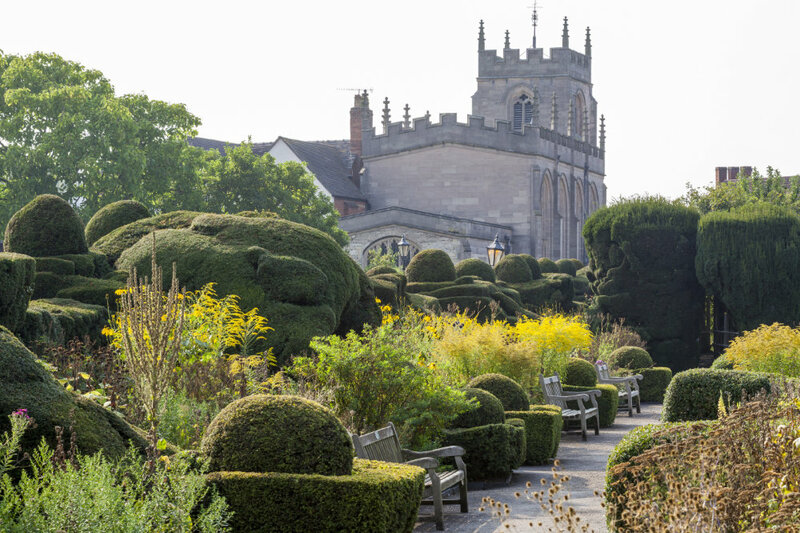 An amazing place for art, literature, history and garden lovers to enjoy, plus its wheelchair-friendly and there’s lots of space for energetic kids and grand-children to run around. 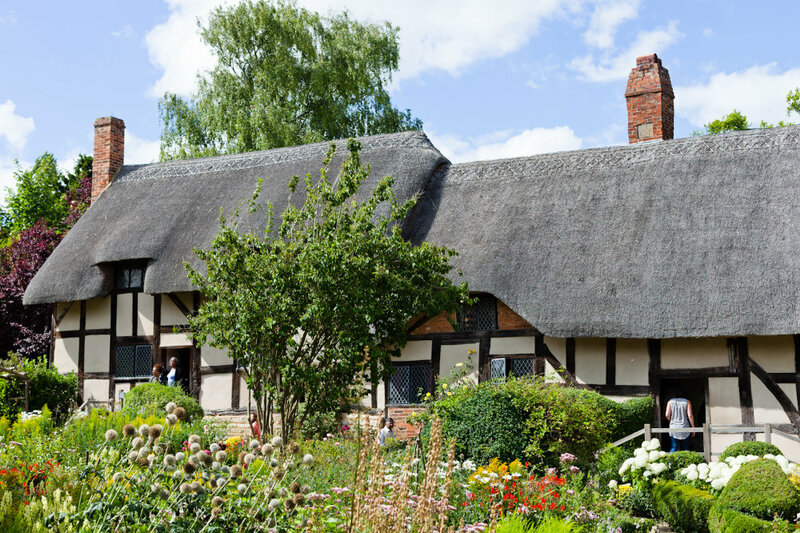 A mile up the road from Stratford-upon-Avon is Anne Hathaway’s Cottage & Gardens, the family home of Shakespeare’s wife, in the pretty hamlet of Shottery. The 550-year-old thatched farmhouse is set within 9-acres of grounds, gardens, woodland walks and an organic orchard. 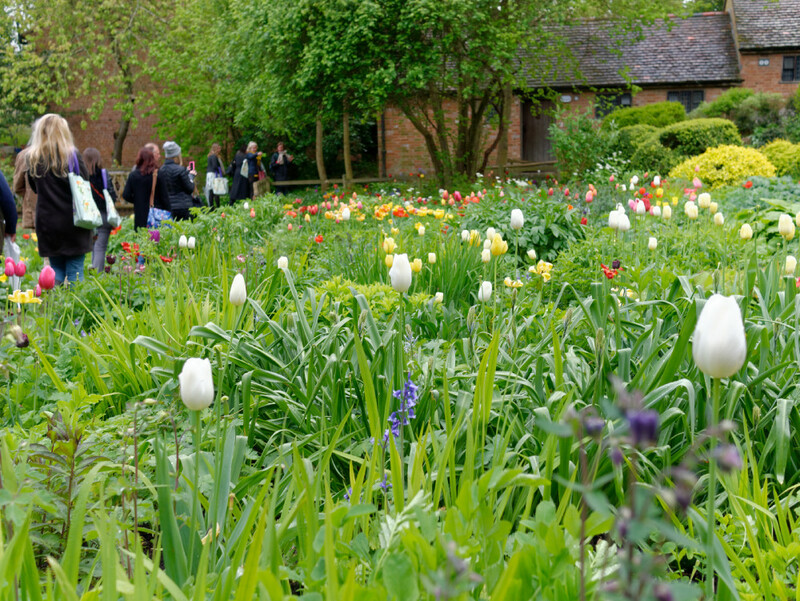 Acquired by Shakespeare Birthplace Trust, the independent charity which cares for all 5 of Shakespeare’s family homes, in 1892 it’s a beautiful, peaceful spot. Head Gardener Glyn Jones is looking at restoring the gardens back to their full glory following original country cottage planting designs by renowned horticulturist Ellen Wilmott, including a rock garden, a series of wrought iron arches for climbing plants and further enhancing the bio-diversity of the organic orchard meadowland. A vegetable plot was introduced in 1998 features heritage varieties grown in partnership with Warwick University. It’s also a safe haven for rescued hedgehogs – with more than 21 hedgehogs re-homed since November 2016. Journey into a realm of magic at Anne Hathaway’s cottage and join resident artist Lisa Yardley in transforming the woodland stage into a Japanese wonderland 10am and 12pm. Drawing from the Japanese Shinto tradition, the belief that everything has a spirit including the trees around us, visitors are invited to use a range of materials to create a magical scene ready for an other-worldly performance of A Midsummer Night’s Dream. Celebrate National Dog Day in these beautiful historic gardens. Bring your dog (and enjoy 20% off admission), a picnic and join in the fun with plenty of activities for your furry friends to enjoy, plus a sizzling barbecue? 12pm- 4pm. 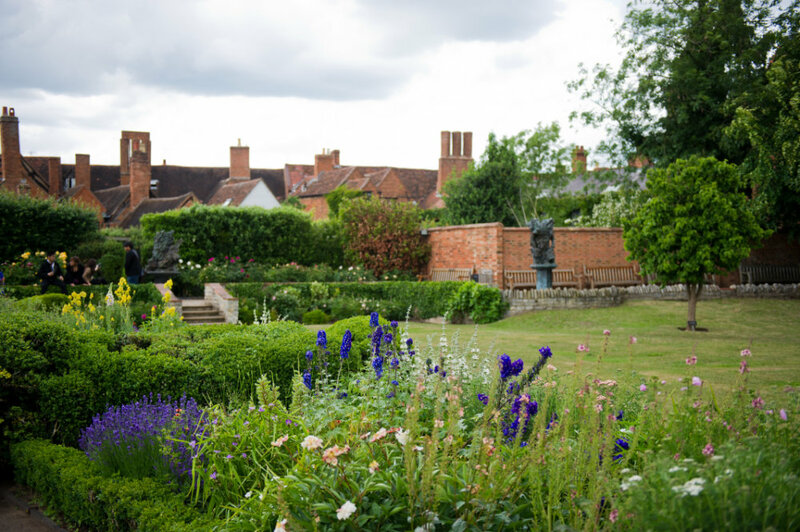 Learn more about Anne’s role at the cottage before she was swept off her feet by a young William Shakespeare. Discover how she would have managed the farm from ensuring the stores of food were kept and how she helped her father with the bookkeeping. Visitors can knead dough, practice quill writing and will have to watch out for the urine throw out. Every hour from 11am-4pm.